The Netherlands East Indies Army Special Forces made three combat jumps in 1948 and 1949. A special wing to commemorate this was designed and worn. The first and most important combat jump was part of the so called 2nd Politionele Actie. A large scale military action against the Indonesian army. The military aim was to reclaim Djokjakarta that was in Indonesian hands. The action started with a combat jump by the Para Battle Group of the Speciale Troepen on the airfield Magoewo close to Djokjakarta. The action started on December 19th 1948. The preparations for “Operation Crow” as this large scale airborne operation was called had already started in january of 1948 when the 1st Para Company was combined with the 2nd Para Company of the Korps Speciale Troepen. The unit was renamed in Para Battle Group (para gevechtsgroep) and led by Captain Eekhout. After the airfield was taken from the Indonesian army, planes with the commando’s of the Korps Speciale Troepen and 2 infantry units were flown in to take the whole city of Djokjakarta back. The Airborne troops were transported in 16 Dakota C-47 planes and a total of 250 para’s made this combat jump. A very extensive description of the further action can be found in the sources (in Dutch). Shortly after this action the men had to make a second combat jump. This was already on December 29th 1948, only 10 days after the first combat jump. This time the action was on the Island of Sumatra to secure the oil fields of Djambi. Soon again a 3rd combat jump would be made during “Operation Mud (Modder)” in Rengat, again protecting oil fields in Sumatra. This time only the 1st Para Company would make the jump. In a period spanning less than 3 weeks 3 combat jumps were made by approximately 350 men in total (not all men in all three jumps). The wing that was used as a qualification wing in 1947 was redesigned in 1949 for those who had particiapted in one or more of these combat jumps. A golden laurel (as in the beret wing) was added to the basic design. As with all badges in the Netherlands East Indies there were metal and cloth versions. 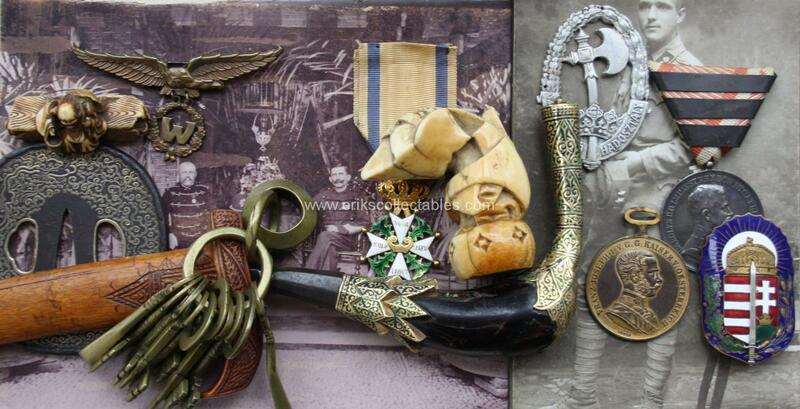 The metal versions of the badges were only made and worn in the Netherlands East Indies Army. Of those only around 350 were ever made of which many owners remained in the new Indonesia. This wing is now very rare and highly collectable! There are several versions of this wing of different size and production. The same design in cloth (with some slight alterations over time) could be worn up to 1985 when the last person that had made combat jumps in Indonesia left the army. More recently Dutch Commando’s made combat jumps in Afghanistan and a new (cloth) wing for combat jumps with the same golden laurel design has come into existence. Below four period photo’s of the metal wing for combat jumps being worn, all taken from internet sources. Bronbeek has a very similar example in their collection with the same non standard closure on the back! Unfortunately that example has lost all colour. Next PostNext Broken wings – APRA revolution participants?